At most of you know, Samuel turned 5 on the 28th of August, so started school a couple of weeks ago. He’s attending Ahuroa School, which is about 10 minutes drive away (we’re planning on moving to Ahuroa before too long). It’s a very small, rural, school (just over 50 students) about half way between Warkworth and the west coast. Given the size and location of the school, it’s hard not to draw comparisons with the primary school that I attended, Pukepoto Primary. I think it had a similar number (perhaps slightly more, and only up to Standard Four, not Form 2) of students when I started in 1985, although by the time I left there were nearly 100 students (it grew larger still, although I think it has dropped again since). It’s obviously rural as well, being about 10 minutes away from a town with around 4000 people (although technically it’s within Auckland City, so perhaps a bit less rural). The biggest difference that struck me was the size of the grounds. Everything seems smaller when you grow up, but Pukepoto Primary School has a huge amount of land compared to Ahuroa School (the map is zoomed in four times as much). I had no idea at the time how lucky we were to have two huge fields, as well as the large playground areas and the creak. Ahuroa makes pretty good use of the space they have, and apparently they can nearly double their capacity, but it’ll certainly be tighter than Pukepoto was. There’s a very different focus on technology – back in the latter half of the eighties there was no school computer at Pukepoto, whereas Ahuroa uses iPods/iPads, has class blogs, and so on. I think this is more a reflection of how integrated technology has become into society, though – I think it was right that there was no computing at Pukepoto in my day, and I don’t think that Ahuroa is unduly or incorrectly pushing it. 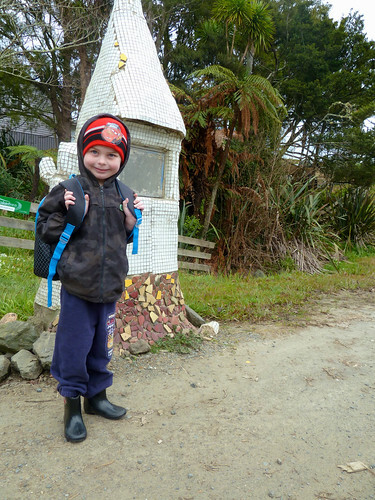 Sam had an extremely gentle introduction to school: Ahuroa has a great “four-year-old Friday’s” system, where four-year-olds come along to school for a couple of hours each Friday (with mum or dad staying with them). It’s more fun than learning, but it’s a great way for the kids to get familiar with the other children at school, the teachers, the environs, and so on. Sam’s been going to these nearly every week since the start of the year, so was already pretty familiar with the school itself, and then had four ‘school visits’ where he stayed for a couple of hours without me or Olyvia during regular school activities. All of these went pretty smoothly – he was excited about finishing kindy and PlayCentre, and about going to school ‘every’ day. His first day was Monday the 29th, and it went reasonably smoothly: he was (apparently) a bit upset at lunchtime because he thought that we would be picking him up then, and there were some tears of relief when we picked him up at the end of the day (2:20), but generally everything was ok.
He’d actually been a little sick for a few days previous – since the Thursday before he hadn’t been sleeping well and over the weekend he complained about a sore ear at night. The night before his birthday he did manage to sleep ok, but the Sunday night wasn’t good, so he must have been fairly tired the first day of school. We weren’t able to get him to his doctor without missing school the first day, so it wasn’t until Tuesday after school we found out he has an ear infection (nothing serious, but it can’t have helped things, and certainly was responsible for the lack of sleep). Monday night he didn’t sleep well at all, and was basically up and about by 4 a.m. – not a good start to a school day! I think he was fairly borderline about going to school on Tuesday, but it was generally ok until we got there and he found out he had a relief teacher (and not the relief teacher he already knew). She was great, but the extra unknown pushed Sam over the edge and he didn’t want to stay at all. I stayed with him for 30 or 40 minutes and then left, figuring that he would calm down fairly quickly like he did the few times he didn’t want to stay at kindy. Unfortunately, an hour or so later I got a phone call from the school letting me know that he hadn’t calmed down, and asking if I could go in and spend the day with him there. Apparently he calmed down a bit once he knew I was coming and once I was there he was ok, although not great. (My first nearly-full day of primary school in over 20 years!). Wednesday his regular teacher was back, and although there were tears when I left, she was able to keep him more-or-less relaxed for the day, so Olyvia & I didn’t have to go in until school finished. Thursday he was apparently even better, although still tear-y when left (he had a full night’s sleep Tuesday and Wednesday night, too, which must make a huge difference as well). When we talked about why he was upset, the main reason was that he thought he should know what to do all the time but didn’t (and, of course, shouldn’t). We’ve talked about asking the other kids (who all seem very nice) and his teacher, and since most school days follow the same pattern, this problem seems to have gone away fairly quickly. By the next week he wasn’t upset at all, and was cheerfully farewelling me each morning. He doesn’t seem to have any objections to going to school each day, although he does look forward to the weekend as well. It’s been quite a change! Posted in Uncategorized.Tagged ahuroa, birthday, milestones, pukepoto, school.